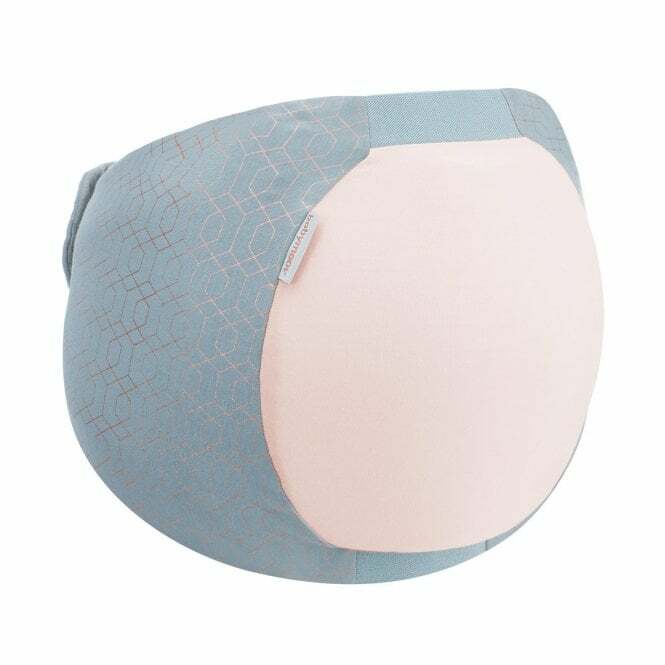 Babymoov Dream Rose Gold, a pregnancy sleep aid, offers comfort for mum and support for baby. The new innovative Babymoov Dream Belt Rose Belt is a brilliant gift idea. It has been co-created by mums and midwives to improve comfort during sleep for mums-to-be. Why should I buy Babymoov Dream Belt Rose Gold? Did you know that a massive 92 percent of pregnant women have trouble sleeping? It may seem like a huge struggle to find a comfortable sleeping position during this period of time. The innovative Dream Belt Rose Gold from Babymoov has been co-created by mums and midwives to improve comfort during sleep for mums-to-be. The spongy memory foam fills the gap between hip and mattress when sleeping on the side whilst the stretchy and comfortable fabric conforms to your body type. The Dream Belt Rose Gold by Babymoov follows every movement of your body during the night. Two elastic strips sit at the top and bottom of the bump for that extra bit of support. Memory foam padding is used to relieve pressure and weight. Stretch fabric adapts to each stage of pregnancy, whilst rear Velcro fastening allows for easy attachment. The adjustable belt of the Dream Belt fits all body shapes and is available in 2 sizes - XS/S and M/L. To make life easier, the Dream Belt can be used directly on the skin or over clothing. The lightweight and stylish design of the Dream Belt Rose Gold is fashionable, especially in this and the and blush pink colourway. Award winning, tested and approved by mums-to-be, the Dream Belt Rose Gold provides great comfort in the sleeping position and holds the baby bump's weight when sleeping on the side. The cover is completely machine washable at 40°. Extremely easy to take on and off, even with a little bump. Most of all, the Dream Belt does not take as much space up in the bed as pillows do! What are the specifications for the Babymoov Dream Belt Rose Gold? Is there a Manufacturer's Warranty for Babymoov Dream Belt Rose Gold? Babymoov offer lifetime warranty for certain products registered within two months of purchase. To apply, go to https://www.babymoov.co.uk/content/22-lifetime-warranty and fill out the form. Applies to products purchased in UK mainland only.